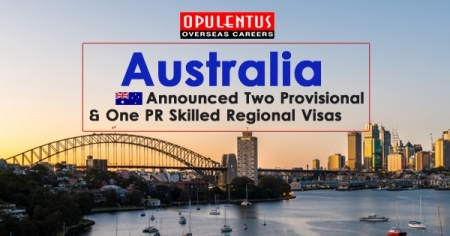 Australia has launched a new permanent visa to get a higher number of skilled workers to Australia regional area. The Skilled Regional Permanent Residence (subclass 191) visa will start from 16 Nov 2022. The detailed statement of the Amendment Migration (Latest Skilled Regional Visas) Laws 2019, announced by the Minister for Multicultural Affairs, Immigration, and Citizenship David Coleman says, "The current skilled regional subclass 191 visa replicates several existing general criteria for Australia permanent residence, and most various visas, including health, security, and character conditions." Immigration experts, explain the new permanent visa will be accessible for those skilled migrants who have previously worked and lived in Australia for a tenure of three years as on 16 Nov 2022. The new Skilled Regional Permanent Residence (Subclass 191) visa may only be utilized for by latest Subclass 491 & Subclass 494 visa holders. Only these migrants will be qualified to appeal for this visa who have obtained a minimum income for 03 years as the provisional regional visa holder. Subclass 491 & Subclass 494 are the two latest regional visas coming in force from Nov this year. The Australia government has stopped the Subclass 187 (Regional Sponsored Migration) permanent visa and Subclass 489 Regional Skilled (Provisional) visa. A latest Skilled Regional Employer Sponsored (Subclass 494) provisional visa has been designed to substitute subclass 187 visa. Subclass 494 visa is to assist organizations in regional Australia to hire skilled overseas workers by Employer-Sponsored and Labour Contract. The other regional visa is the Skilled Work Regional (Provisional) Subclass 491 visa. It is points based visa for candidates sponsored by a Territory or State government agency or sponsored by a family member living in a selected regional area. The skilled regional Subclass 491 visa will substitute subclass 489 visa which was a famous visa among skilled workers who aspired to migrate to Australia regional area. The delayed start for the Skilled Regional Permanent Residence (subclass 191) visa is because of the condition to have hold an Australia regional provisional visa for 03 years prior to the applying for the regional Subclass 191 visa. Eligibility will not start prior to 16 Nov 2022.